As the first Latina Supreme Court Justice, Sonia Sotomayor has inspired young people around the world to reach for their dreams. But what inspired her? For young Sonia, the answer was books! They were her mirrors, her maps, her friends, and her teachers. They helped her to connect with her family in New York and in Puerto Rico, to deal with her diabetes diagnosis, to cope with her father's death, to uncover the secrets of the world, and to dream of a future for herself in which anything was possible. In Turning Pages, Justice Sotomayor shares that love of books with a new generation of readers, and inspires them to read and puzzle and dream for themselves. 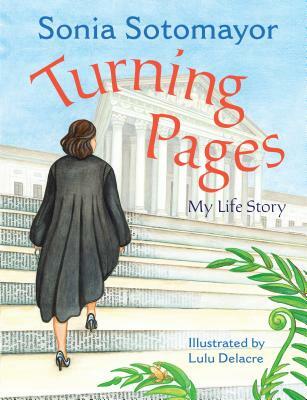 Accompanied by Lulu Delacre's vibrant art, this story of the Justice's life shows readers that the world is full of promise and possibility--all they need to do is turn the page. Sonia Sotomayor was born in the Bronx, New York. She earned a BA from Princeton University and a JD from Yale Law School. She served as Assistant District Attorney in New York County, and then as a litigator at Pavia & Harcourt. In 1991, when President George H.W. Bush nominated her to the US District Court, Southern District of New York. In 1997, President William Jefferson Clinton nominated her to the US Court of Appeals for the Second Circuit. President Barack Obama nominated her as an Associate Justice of the Supreme Court on May 26, 2009, and she assumed this role August 8, 2009, becoming the first Latina to ever hold such a high position. She is the author of My Beloved World and The Beloved World of Sonia Sotomayor. Lulu Delacre (www.luludelacre.com) has been writing and illustrating children's books since 1980. Born and raised in Puerto Rico to Argentinean parents, Delacre is a three-time Pura Belpré Award honoree. Her thirty-eight titles include Arroz con Leche: Popular Songs and Rhymes from Latin America; Us, in Progress: Short Stories About Young Latinos; and ¡Olinguito, de la A a la Z! Descubriendo el bosque nublado/Olinguito, from A to Z! Unveiling the Cloud Forest. Delacre has lectured internationally, served as a juror for the National Book Awards, and exhibited her work at The Eric Carle Museum of Picture Book Art, among other venues.